Change Pinterest Board Cover Photo? You wrote earlier about how to change the cover photo on a Pinterest pinboard, but that one’s obsolete! How do I change my cover photo with the latest user interface? Usually changes are subtle and nuanced, a button moving somewhere else, an option being relabeled in a menu. Not this time! I’m going to change the cover photo of my Books, Movies and TV pinboard. Tip: There used to be a ‘change cover photo’ option that appeared if you hovered over the image. That’s no more! As you can see, you can change the name, add a description, associate this board with a map location or… change the cover image by clicking on “Change” just below the category option. At this point you can use the arrow key to step through possible images to find your favorite. Note that it crops a bit weird (you can see it above) so keep that in mind when you’re choosing. Got the perfect image? Sweet! 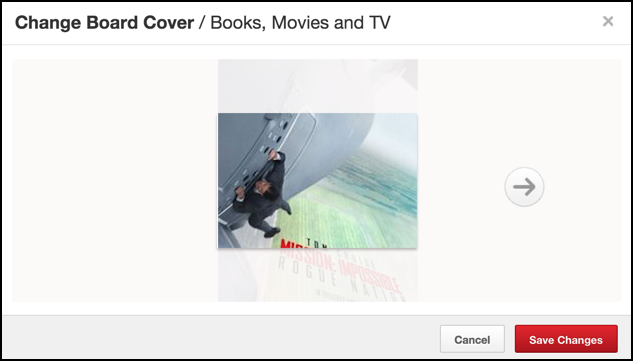 Click on “Save Changes” to update your Pinterest board cover photo! Recognize it? It’s from the publicity photo for the Disney film Tomorrowland. And that’s how ya do it on Pinterest. Looking for me on Pinterest? Great. You can find me here: Dave Taylor on Pinterest. Please do follow, I post tons of pics. hey Dave I have a question I have a fiance who has a friend who has her profile pic on pinterest and youtube as him and her when they used to see each other and he asked her to change the picture due to respect to our relationship she changed the picture and took her and him off then later the picture of her and him returns she states to him that Pinterest and youtube miraculously changed the picture back and she didn’t do it. Is that possible? I don’t think because once you change your profile pic it stays. Is there any way that it changes itself back. Sheryl, it’s possible that it would revert to an earlier pic, but it sounds like she might have forgotten to click “Save” and wait until it finished the upload. Have her try again and good luck! Absolutely hate the changes that Pinterest have made, hate it, hate it, hate. Have told them, they couldn’t care less. Help! I doesn’t save my board cover changes. Save the cover, check. Save the board, check. And Pinterest won’t keep my changes. I have tried with different boards and nothing. I hate the new update with three photos. The new setup doesn’t make me want to click on anything. Eye candy appeal is gone. Will Pinterest listen? Both Cover and Map are not in my edit box as the other items are. I’m trying to set up my boards; just started a few days ago. Does Pinterest restrict new users to blank boards? Even with my glasses on, I couldn’t find where to change my cover photos in Pinterest!